This article is about the heritable unit for transmission of biological traits. For other uses, see Gene (disambiguation). The concept of a gene continues to be refined as new phenomena are discovered. For example, regulatory regions of a gene can be far removed from its coding regions, and coding regions can be split into several exons. Some viruses store their genome in RNA instead of DNA and some gene products are functional non-coding RNAs. Therefore, a broad, modern working definition of a gene is any discrete locus of heritable, genomic sequence which affect an organism's traits by being expressed as a functional product or by regulation of gene expression. The term gene was introduced by Danish botanist, plant physiologist and geneticist Wilhelm Johannsen in 1909. It is inspired by the ancient Greek: γόνος, gonos, that means offspring and procreation. The existence of discrete inheritable units was first suggested by Gregor Mendel (1822–1884). From 1857 to 1864, in Brno (Czech Republic), he studied inheritance patterns in 8000 common edible pea plants, tracking distinct traits from parent to offspring. He described these mathematically as 2n combinations where n is the number of differing characteristics in the original peas. Although he did not use the term gene, he explained his results in terms of discrete inherited units that give rise to observable physical characteristics. This description prefigured Wilhelm Johannsen's distinction between genotype (the genetic material of an organism) and phenotype (the visible traits of that organism). Mendel was also the first to demonstrate independent assortment, the distinction between dominant and recessive traits, the distinction between a heterozygote and homozygote, and the phenomenon of discontinuous inheritance. Prior to Mendel's work, the dominant theory of heredity was one of blending inheritance, which suggested that each parent contributed fluids to the fertilisation process and that the traits of the parents blended and mixed to produce the offspring. Charles Darwin developed a theory of inheritance he termed pangenesis, from Greek pan ("all, whole") and genesis ("birth") / genos ("origin"). Darwin used the term gemmule to describe hypothetical particles that would mix during reproduction. Mendel's work went largely unnoticed after its first publication in 1866, but was rediscovered in the late 19th century by Hugo de Vries, Carl Correns, and Erich von Tschermak, who (claimed to have) reached similar conclusions in their own research. Specifically, in 1889, Hugo de Vries published his book Intracellular Pangenesis, in which he postulated that different characters have individual hereditary carriers and that inheritance of specific traits in organisms comes in particles. De Vries called these units "pangenes" (Pangens in German), after Darwin's 1868 pangenesis theory. Sixteen years later, in 1905, Wilhelm Johannsen introduced the term 'gene' and William Bateson that of 'genetics' while Eduard Strasburger, amongst others, still used the term 'pangene' for the fundamental physical and functional unit of heredity. Advances in understanding genes and inheritance continued throughout the 20th century. Deoxyribonucleic acid (DNA) was shown to be the molecular repository of genetic information by experiments in the 1940s to 1950s. The structure of DNA was studied by Rosalind Franklin and Maurice Wilkins using X-ray crystallography, which led James D. Watson and Francis Crick to publish a model of the double-stranded DNA molecule whose paired nucleotide bases indicated a compelling hypothesis for the mechanism of genetic replication. In the early 1950s the prevailing view was that the genes in a chromosome acted like discrete entities, indivisible by recombination and arranged like beads on a string. The experiments of Benzer using mutants defective in the rII region of bacteriophage T4 (1955–1959) showed that individual genes have a simple linear structure and are likely to be equivalent to a linear section of DNA. Collectively, this body of research established the central dogma of molecular biology, which states that proteins are translated from RNA, which is transcribed from DNA. This dogma has since been shown to have exceptions, such as reverse transcription in retroviruses. The modern study of genetics at the level of DNA is known as molecular genetics. In 1972, Walter Fiers and his team were the first to determine the sequence of a gene: that of Bacteriophage MS2 coat protein. The subsequent development of chain-termination DNA sequencing in 1977 by Frederick Sanger improved the efficiency of sequencing and turned it into a routine laboratory tool. An automated version of the Sanger method was used in early phases of the Human Genome Project. The theories developed in the early 20th century to integrate Mendelian genetics with Darwinian evolution are called the modern synthesis, a term introduced by Julian Huxley. Evolutionary biologists have subsequently modified this concept, such as George C. Williams' gene-centric view of evolution. He proposed an evolutionary concept of the gene as a unit of natural selection with the definition: "that which segregates and recombines with appreciable frequency. ":24 In this view, the molecular gene transcribes as a unit, and the evolutionary gene inherits as a unit. Related ideas emphasizing the centrality of genes in evolution were popularized by Richard Dawkins. Fluorescent microscopy image of a human female karyotype, showing 23 pairs of chromosomes . The DNA is stained red, with regions rich in housekeeping genes further stained in green. The largest chromosomes are around 10 times the size of the smallest. The total complement of genes in an organism or cell is known as its genome, which may be stored on one or more chromosomes. A chromosome consists of a single, very long DNA helix on which thousands of genes are encoded. :4.2 The region of the chromosome at which a particular gene is located is called its locus. Each locus contains one allele of a gene; however, members of a population may have different alleles at the locus, each with a slightly different gene sequence. Prokaryotes (bacteria and archaea) typically store their genomes on a single large, circular chromosome. Similarly, some eukaryotic organelles contain a remnant circular chromosome with a small number of genes. :14.4 Prokaryotes sometimes supplement their chromosome with additional small circles of DNA called plasmids, which usually encode only a few genes and are transferable between individuals. For example, the genes for antibiotic resistance are usually encoded on bacterial plasmids and can be passed between individual cells, even those of different species, via horizontal gene transfer. Whereas the chromosomes of prokaryotes are relatively gene-dense, those of eukaryotes often contain regions of DNA that serve no obvious function. Simple single-celled eukaryotes have relatively small amounts of such DNA, whereas the genomes of complex multicellular organisms, including humans, contain an absolute majority of DNA without an identified function. This DNA has often been referred to as "junk DNA". However, more recent analyses suggest that, although protein-coding DNA makes up barely 2% of the human genome, about 80% of the bases in the genome may be expressed, so the term "junk DNA" may be a misnomer. The structure of a eukaryotic protein-coding gene. Regulatory sequence controls when and where expression occurs for the protein coding region (red). Promoter and enhancer regions (yellow) regulate the transcription of the gene into a pre-mRNA which is modified to remove introns (light grey) and add a 5' cap and poly-A tail (dark grey). The mRNA 5' and 3' untranslated regions (blue) regulate translation into the final protein product. The structure of a prokaryotic operon of protein-coding genes. 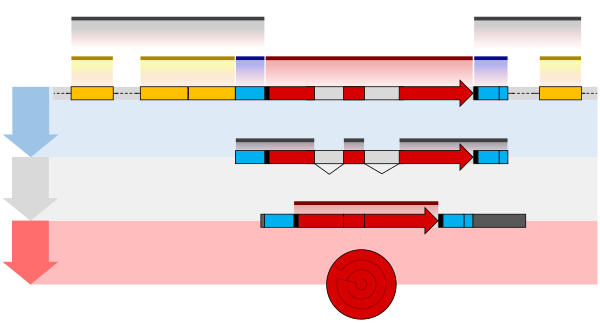 Regulatory sequence controls when expression occurs for the multiple protein coding regions (red). Promoter, operator and enhancer regions (yellow) regulate the transcription of the gene into an mRNA. The mRNA untranslated regions (blue) regulate translation into the final protein products. The structure of a gene consists of many elements of which the actual protein coding sequence is often only a small part. These include DNA regions that are not transcribed as well as untranslated regions of the RNA. Additionally, genes can have regulatory regions many kilobases upstream or downstream of the open reading frame that alter expression. These act by binding to transcription factors which then cause the DNA to loop so that the regulatory sequence (and bound transcription factor) become close to the RNA polymerase binding site. For example, enhancers increase transcription by binding an activator protein which then helps to recruit the RNA polymerase to the promoter; conversely silencers bind repressor proteins and make the DNA less available for RNA polymerase. The transcribed pre-mRNA contains untranslated regions at both ends which contain a ribosome binding site, terminator and start and stop codons. In addition, most eukaryotic open reading frames contain untranslated introns which are removed before the exons are translated. The sequences at the ends of the introns dictate the splice sites to generate the final mature mRNA which encodes the protein or RNA product. Defining exactly what section of a DNA sequence comprises a gene is difficult. Regulatory regions of a gene such as enhancers do not necessarily have to be close to the coding sequence on the linear molecule because the intervening DNA can be looped out to bring the gene and its regulatory region into proximity. Similarly, a gene's introns can be much larger than its exons. Regulatory regions can even be on entirely different chromosomes and operate in trans to allow regulatory regions on one chromosome to come in contact with target genes on another chromosome. Early work in molecular genetics suggested the concept that one gene makes one protein. This concept (originally called the one gene-one enzyme hypothesis) emerged from an influential 1941 paper by George Beadle and Edward Tatum on experiments with mutants of the fungus Neurospora crassa. Norman Horowitz, an early colleague on the Neurospora research, reminisced in 2004 that “these experiments founded the science of what Beadle and Tatum called biochemical genetics. In actuality they proved to be the opening gun in what became molecular genetics and all the developments that have followed from that.” The one gene-one protein concept has been refined since the discovery of genes that can encode multiple proteins by alternative splicing and coding sequences split in short section across the genome whose mRNAs are concatenated by trans-splicing. A broad operational definition is sometimes used to encompass the complexity of these diverse phenomena, where a gene is defined as a union of genomic sequences encoding a coherent set of potentially overlapping functional products. This definition categorizes genes by their functional products (proteins or RNA) rather than their specific DNA loci, with regulatory elements classified as gene-associated regions. In all organisms, two steps are required to read the information encoded in a gene's DNA and produce the protein it specifies. First, the gene's DNA is transcribed to messenger RNA (mRNA). :6.1 Second, that mRNA is translated to protein. :6.2 RNA-coding genes must still go through the first step, but are not translated into protein. The process of producing a biologically functional molecule of either RNA or protein is called gene expression, and the resulting molecule is called a gene product. The nucleotide sequence of a gene's DNA specifies the amino acid sequence of a protein through the genetic code. Sets of three nucleotides, known as codons, each correspond to a specific amino acid. :6 The principle that three sequential bases of DNA code for each amino acid was demonstrated in 1961 using frameshift mutations in the rIIB gene of bacteriophage T4 (see Crick, Brenner et al. experiment). Additionally, a "start codon", and three "stop codons" indicate the beginning and end of the protein coding region. There are 64 possible codons (four possible nucleotides at each of three positions, hence 43 possible codons) and only 20 standard amino acids; hence the code is redundant and multiple codons can specify the same amino acid. The correspondence between codons and amino acids is nearly universal among all known living organisms. Genes are regulated so that they are expressed only when the product is needed, since expression draws on limited resources. :7 A cell regulates its gene expression depending on its external environment (e.g. available nutrients, temperature and other stresses), its internal environment (e.g. cell division cycle, metabolism, infection status), and its specific role if in a multicellular organism. Gene expression can be regulated at any step: from transcriptional initiation, to RNA processing, to post-translational modification of the protein. The regulation of lactose metabolism genes in E. coli (lac operon) was the first such mechanism to be described in 1961. A typical protein-coding gene is first copied into RNA as an intermediate in the manufacture of the final protein product. :6.1 In other cases, the RNA molecules are the actual functional products, as in the synthesis of ribosomal RNA and transfer RNA. Some RNAs known as ribozymes are capable of enzymatic function, and microRNA has a regulatory role. The DNA sequences from which such RNAs are transcribed are known as non-coding RNA genes. Some viruses store their entire genomes in the form of RNA, and contain no DNA at all. Because they use RNA to store genes, their cellular hosts may synthesize their proteins as soon as they are infected and without the delay in waiting for transcription. On the other hand, RNA retroviruses, such as HIV, require the reverse transcription of their genome from RNA into DNA before their proteins can be synthesized. RNA-mediated epigenetic inheritance has also been observed in plants and very rarely in animals. Inheritance of a gene that has two different alleles (blue and white). 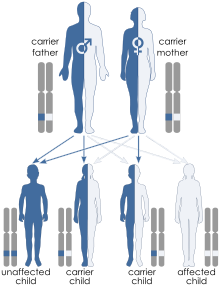 The gene is located on an autosomal chromosome. The white allele is recessive to the blue allele. The probability of each outcome in the children's generation is one quarter, or 25 percent. Alleles at a locus may be dominant or recessive; dominant alleles give rise to their corresponding phenotypes when paired with any other allele for the same trait, whereas recessive alleles give rise to their corresponding phenotype only when paired with another copy of the same allele. If you know the genotypes of the organisms, you can determine which alleles are dominant and which are recessive. For example, if the allele specifying tall stems in pea plants is dominant over the allele specifying short stems, then pea plants that inherit one tall allele from one parent and one short allele from the other parent will also have tall stems. Mendel's work demonstrated that alleles assort independently in the production of gametes, or germ cells, ensuring variation in the next generation. Although Mendelian inheritance remains a good model for many traits determined by single genes (including a number of well-known genetic disorders) it does not include the physical processes of DNA replication and cell division. The rate of DNA replication in living cells was first measured as the rate of phage T4 DNA elongation in phage-infected E. coli and found to be impressively rapid. During the period of exponential DNA increase at 37 °C, the rate of elongation was 749 nucleotides per second. During the process of meiotic cell division, an event called genetic recombination or crossing-over can sometimes occur, in which a length of DNA on one chromatid is swapped with a length of DNA on the corresponding homologous non-sister chromatid. This can result in reassortment of otherwise linked alleles. :5.5 The Mendelian principle of independent assortment asserts that each of a parent's two genes for each trait will sort independently into gametes; which allele an organism inherits for one trait is unrelated to which allele it inherits for another trait. This is in fact only true for genes that do not reside on the same chromosome, or are located very far from one another on the same chromosome. The closer two genes lie on the same chromosome, the more closely they will be associated in gametes and the more often they will appear together (known as genetic linkage). Genes that are very close are essentially never separated because it is extremely unlikely that a crossover point will occur between them. When multiple different alleles for a gene are present in a species's population it is called polymorphic. Most different alleles are functionally equivalent, however some alleles can give rise to different phenotypic traits. A gene's most common allele is called the wild type, and rare alleles are called mutants. The genetic variation in relative frequencies of different alleles in a population is due to both natural selection and genetic drift. The wild-type allele is not necessarily the ancestor of less common alleles, nor is it necessarily fitter. Genes with a most recent common ancestor, and thus a shared evolutionary ancestry, are known as homologs. These genes appear either from gene duplication within an organism's genome, where they are known as paralogous genes, or are the result of divergence of the genes after a speciation event, where they are known as orthologous genes,:7.6 and often perform the same or similar functions in related organisms. It is often assumed that the functions of orthologous genes are more similar than those of paralogous genes, although the difference is minimal. The relationship between genes can be measured by comparing the sequence alignment of their DNA. :7.6 The degree of sequence similarity between homologous genes is called conserved sequence. Most changes to a gene's sequence do not affect its function and so genes accumulate mutations over time by neutral molecular evolution. Additionally, any selection on a gene will cause its sequence to diverge at a different rate. 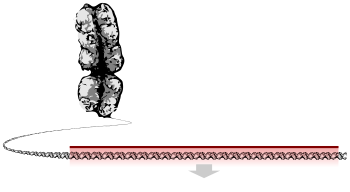 Genes under stabilizing selection are constrained and so change more slowly whereas genes under directional selection change sequence more rapidly. The sequence differences between genes can be used for phylogenetic analyses to study how those genes have evolved and how the organisms they come from are related. Evolutionary fate of duplicate genes. "Orphan" genes, whose sequence shows no similarity to existing genes, are less common than gene duplicates. Estimates of the number of genes with no homologs outside humans range from 18 to 60. Two primary sources of orphan protein-coding genes are gene duplication followed by extremely rapid sequence change, such that the original relationship is undetectable by sequence comparisons, and de novo conversion of a previously non-coding sequence into a protein-coding gene. De novo genes are typically shorter and simpler in structure than most eukaryotic genes, with few if any introns. Over long evolutionary time periods, de novo gene birth may be responsible for a significant fraction of taxonomically-restricted gene families. Horizontal gene transfer refers to the transfer of genetic material through a mechanism other than reproduction. This mechanism is a common source of new genes in prokaryotes, sometimes thought to contribute more to genetic variation than gene duplication. It is a common means of spreading antibiotic resistance, virulence, and adaptive metabolic functions. Although horizontal gene transfer is rare in eukaryotes, likely examples have been identified of protist and alga genomes containing genes of bacterial origin. The genome is the total genetic material of an organism and includes both the genes and non-coding sequences. Representative genome sizes for plants (green), vertebrates (blue), invertebrates (red), fungus (yellow), bacteria (purple), and viruses (grey). An inset on the right shows the smaller genomes expanded 100-fold area-wise. The genome size, and the number of genes it encodes varies widely between organisms. The smallest genomes occur in viruses, and viroids (which act as a single non-coding RNA gene). Conversely, plants can have extremely large genomes, with rice containing >46,000 protein-coding genes. The total number of protein-coding genes (the Earth's proteome) is estimated to be 5 million sequences. Although the number of base-pairs of DNA in the human genome has been known since the 1960s, the estimated number of genes has changed over time as definitions of genes, and methods of detecting them have been refined. Initial theoretical predictions of the number of human genes were as high as 2,000,000. Early experimental measures indicated there to be 50,000–100,000 transcribed genes (expressed sequence tags). Subsequently, the sequencing in the Human Genome Project indicated that many of these transcripts were alternative variants of the same genes, and the total number of protein-coding genes was revised down to ~20,000 with 13 genes encoded on the mitochondrial genome. With the GENCODE annotation project, that estimate has continued to fall to 19,000. Of the human genome, only 1–2% consists of protein-coding genes, with the remainder being 'noncoding' DNA such as introns, retrotransposons, and noncoding RNAs. Every multicellular organism has all its genes in each cell of its body but not every gene functions in every cell . Essential genes are the set of genes thought to be critical for an organism's survival. This definition assumes the abundant availability of all relevant nutrients and the absence of environmental stress. Only a small portion of an organism's genes are essential. In bacteria, an estimated 250–400 genes are essential for Escherichia coli and Bacillus subtilis, which is less than 10% of their genes. Half of these genes are orthologs in both organisms and are largely involved in protein synthesis. In the budding yeast Saccharomyces cerevisiae the number of essential genes is slightly higher, at 1000 genes (~20% of their genes). Although the number is more difficult to measure in higher eukaryotes, mice and humans are estimated to have around 2000 essential genes (~10% of their genes). The synthetic organism, Syn 3, has a minimal genome of 473 essential genes and quasi-essential genes (necessary for fast growth), although 149 have unknown function. Essential genes include housekeeping genes (critical for basic cell functions) as well as genes that are expressed at different times in the organisms development or life cycle. Housekeeping genes are used as experimental controls when analysing gene expression, since they are constitutively expressed at a relatively constant level. Gene nomenclature has been established by the HUGO Gene Nomenclature Committee (HGNC), a committee of the Human Genome Organisation, for each known human gene in the form of an approved gene name and symbol (short-form abbreviation), which can be accessed through a database maintained by HGNC. Symbols are chosen to be unique, and each gene has only one symbol (although approved symbols sometimes change). Symbols are preferably kept consistent with other members of a gene family and with homologs in other species, particularly the mouse due to its role as a common model organism. Comparison of conventional plant breeding with transgenic and cisgenic genetic modification. Genetic engineering is the modification of an organism's genome through biotechnology. Since the 1970s, a variety of techniques have been developed to specifically add, remove and edit genes in an organism. Recently developed genome engineering techniques use engineered nuclease enzymes to create targeted DNA repair in a chromosome to either disrupt or edit a gene when the break is repaired. The related term synthetic biology is sometimes used to refer to extensive genetic engineering of an organism. Genetic engineering is now a routine research tool with model organisms. For example, genes are easily added to bacteria and lineages of knockout mice with a specific gene's function disrupted are used to investigate that gene's function. Many organisms have been genetically modified for applications in agriculture, industrial biotechnology, and medicine. For multicellular organisms, typically the embryo is engineered which grows into the adult genetically modified organism. However, the genomes of cells in an adult organism can be edited using gene therapy techniques to treat genetic diseases. ^ a b Gericke, Niklas Markus; Hagberg, Mariana (5 December 2006). "Definition of historical models of gene function and their relation to students' understanding of genetics". Science & Education. 16 (7–8): 849–881. Bibcode:2007Sc&Ed..16..849G. doi:10.1007/s11191-006-9064-4. ^ Pearson H (May 2006). "Genetics: what is a gene?". Nature. 441 (7092): 398–401. Bibcode:2006Natur.441..398P. doi:10.1038/441398a. PMID 16724031. ^ a b c Pennisi E (June 2007). "Genomics. DNA study forces rethink of what it means to be a gene". Science. 316 (5831): 1556–1557. doi:10.1126/science.316.5831.1556. PMID 17569836. ^ a b Johannsen, W. (1905). Arvelighedslærens elementer ("The Elements of Heredity". Copenhagen). Rewritten, enlarged and translated into German as Elemente der exakten Erblichkeitslehre (Jena: Gustav Fischer, 1909; Scanned full text. ^ Noble D (September 2008). "Genes and causation" (Free full text). Philosophical Transactions of the Royal Society of London. Series A, Mathematical and Physical Sciences. 366 (1878): 3001–3015. Bibcode:2008RSPTA.366.3001N. doi:10.1098/rsta.2008.0086. PMID 18559318. ^ Magner, Lois N. (2002). A History of the Life Sciences (Third ed.). Marcel Dekker, CRC Press. p. 371. ISBN 978-0-203-91100-6. ^ Henig, Robin Marantz (2000). The Monk in the Garden: The Lost and Found Genius of Gregor Mendel, the Father of Genetics. Boston: Houghton Mifflin. pp. 1–9. ISBN 978-0395-97765-1. ^ a b c Gerstein MB, Bruce C, Rozowsky JS, Zheng D, Du J, Korbel JO, Emanuelsson O, Zhang ZD, Weissman S, Snyder M (June 2007). "What is a gene, post-ENCODE? History and updated definition". Genome Research. 17 (6): 669–681. doi:10.1101/gr.6339607. PMID 17567988. ^ Gager, C.S., Translator's preface to Intracellular Pangenesis, p. viii. ^ Avery, OT; MacLeod, CM; McCarty, M (1944). "Studies on the Chemical Nature of the Substance Inducing Transformation of Pneumococcal Types: Induction of Transformation by a Desoxyribonucleic Acid Fraction Isolated from Pneumococcus Type III". The Journal of Experimental Medicine. 79 (2): 137–158. doi:10.1084/jem.79.2.137. PMC 2135445. PMID 19871359. Reprint: Avery, OT; MacLeod, CM; McCarty, M (1979). "Studies on the chemical nature of the substance inducing transformation of pneumococcal types. Inductions of transformation by a desoxyribonucleic acid fraction isolated from pneumococcus type III". The Journal of Experimental Medicine. 149 (2): 297–326. doi:10.1084/jem.149.2.297. PMC 2184805. PMID 33226. ^ Hershey, AD; Chase, M (1952). "Independent functions of viral protein and nucleic acid in growth of bacteriophage". The Journal of General Physiology. 36 (1): 39–56. doi:10.1085/jgp.36.1.39. PMC 2147348. PMID 12981234. ^ Judson, Horace (1979). The Eighth Day of Creation: Makers of the Revolution in Biology. Cold Spring Harbor Laboratory Press. pp. 51–169. ISBN 978-0-87969-477-7. ^ Watson, J.D. ; Crick, FH (1953). "Molecular Structure of Nucleic Acids: A Structure for Deoxyribose Nucleic Acid" (PDF). Nature. 171 (4356): 737–738. Bibcode:1953Natur.171..737W. doi:10.1038/171737a0. PMID 13054692. ^ Benzer S (1955). "Fine Structure of a Genetic Region in Bacteriophage". Proc. Natl. Acad. Sci. U.S.A. 41 (6): 344–354. Bibcode:1955PNAS...41..344B. doi:10.1073/pnas.41.6.344. PMC 528093. PMID 16589677. ^ Benzer S (1959). "On the Topology of the Genetic Fine Structure". Proc. Natl. Acad. Sci. U.S.A. 45 (11): 1607–1620. Bibcode:1959PNAS...45.1607B. doi:10.1073/pnas.45.11.1607. PMC 222769. PMID 16590553. ^ Min Jou W, Haegeman G, Ysebaert M, Fiers W (May 1972). "Nucleotide sequence of the gene coding for the bacteriophage MS2 coat protein". Nature. 237 (5350): 82–88. Bibcode:1972Natur.237...82J. doi:10.1038/237082a0. PMID 4555447. ^ Sanger, F; Nicklen, S; Coulson, AR (1977). "DNA sequencing with chain-terminating inhibitors". Proceedings of the National Academy of Sciences of the United States of America. 74 (12): 5463–5467. Bibcode:1977PNAS...74.5463S. doi:10.1073/pnas.74.12.5463. PMC 431765. PMID 271968. ^ Adams, Jill U. (2008). "DNA Sequencing Technologies". Nature Education Knowledge. SciTable. Nature Publishing Group. 1 (1): 193. ^ Huxley, Julian (1942). Evolution: the Modern Synthesis. Cambridge, Massachusetts: MIT Press. ISBN 978-0262513661. ^ Williams, George C. (2001). Adaptation and Natural Selection a Critique of Some Current Evolutionary Thought (Online ed.). Princeton: Princeton University Press. ISBN 9781400820108. ^ Dawkins, Richard (1977). The selfish gene (Repr. (with corr.) ed.). London: Oxford University Press. ISBN 978-0-19-857519-1. ^ Dawkins, Richard (1989). The extended phenotype (Paperback ed.). Oxford: Oxford University Press. ISBN 978-0-19-286088-0. ^ a b c d e f g h i j k l m n o p q r s t u v w x y z aa ab ac ad ae af ag ah ai aj ak Alberts B, Johnson A, Lewis J, Raff M, Roberts K, Walter P (2002). Molecular Biology of the Cell (Fourth ed.). New York: Garland Science. ISBN 978-0-8153-3218-3. ^ Stryer L, Berg JM, Tymoczko JL (2002). Biochemistry (5th ed.). San Francisco: W.H. Freeman. ISBN 978-0-7167-4955-4. ^ Bolzer, Andreas; Kreth, Gregor; Solovei, Irina; Koehler, Daniela; Saracoglu, Kaan; Fauth, Christine; Müller, Stefan; Eils, Roland; Cremer, Christoph; Speicher, Michael R.; Cremer, Thomas (2005). "Three-Dimensional Maps of All Chromosomes in Human Male Fibroblast Nuclei and Prometaphase Rosettes". PLoS Biology. 3 (5): e157. doi:10.1371/journal.pbio.0030157. PMC 1084335. PMID 15839726. ^ Braig M, Schmitt CA (March 2006). "Oncogene-induced senescence: putting the brakes on tumor development". Cancer Research. 66 (6): 2881–2884. doi:10.1158/0008-5472.CAN-05-4006. PMID 16540631. ^ a b Bennett, PM (March 2008). "Plasmid encoded antibiotic resistance: acquisition and transfer of antibiotic resistance genes in bacteria". British Journal of Pharmacology. 153 Suppl 1: S347–357. doi:10.1038/sj.bjp.0707607. PMC 2268074. PMID 18193080. ^ International Human Genome Sequencing Consortium (October 2004). "Finishing the euchromatic sequence of the human genome". Nature. 431 (7011): 931–945. Bibcode:2004Natur.431..931H. doi:10.1038/nature03001. PMID 15496913. ^ a b Shafee, Thomas; Lowe, Rohan (2017). "Eukaryotic and prokaryotic gene structure". WikiJournal of Medicine. 4 (1). doi:10.15347/wjm/2017.002. ISSN 2002-4436. ^ Mortazavi A, Williams BA, McCue K, Schaeffer L, Wold B (July 2008). "Mapping and quantifying mammalian transcriptomes by RNA-Seq". Nature Methods. 5 (7): 621–628. doi:10.1038/nmeth.1226. PMID 18516045. ^ Pennacchio, L.A.; Bickmore, W.; Dean, A.; Nobrega, M.A. ; Bejerano, G. (2013). "Enhancers: Five essential questions". Nature Reviews Genetics. 14 (4): 288–295. doi:10.1038/nrg3458. PMC 4445073. PMID 23503198. ^ Maston, G.A. ; Evans, S.K. ; Green, M.R. (2006). "Transcriptional Regulatory Elements in the Human Genome". Annual Review of Genomics and Human Genetics. 7: 29–59. doi:10.1146/annurev.genom.7.080505.115623. PMID 16719718. ^ Mignone, Flavio; Gissi, Carmela; Liuni, Sabino; Pesole, Graziano (28 February 2002). "Untranslated regions of mRNAs". Genome Biology. 3 (3): reviews0004. doi:10.1186/gb-2002-3-3-reviews0004. ISSN 1465-6906. PMC 139023. PMID 11897027. ^ Bicknell AA, Cenik C, Chua HN, Roth FP, Moore MJ (December 2012). "Introns in UTRs: why we should stop ignoring them". BioEssays. 34 (12): 1025–1034. doi:10.1002/bies.201200073. PMID 23108796. ^ Salgado, H.; Moreno-Hagelsieb, G.; Smith, T.; Collado-Vides, J. (2000). "Operons in Escherichia coli: Genomic analyses and predictions". Proceedings of the National Academy of Sciences. 97 (12): 6652–6657. Bibcode:2000PNAS...97.6652S. doi:10.1073/pnas.110147297. PMC 18690. PMID 10823905. ^ Blumenthal, Thomas (November 2004). "Operons in eukaryotes". Briefings in Functional Genomics & Proteomics. 3 (3): 199–211. doi:10.1093/bfgp/3.3.199. ISSN 2041-2649. PMID 15642184. ^ Jacob F, Monod J (1961). "Genetic regulatory mechanisms in the synthesis of proteins". J. Mol. Biol. 3 (3): 318–356. doi:10.1016/S0022-2836(61)80072-7. PMID 13718526. ^ Spilianakis CG, Lalioti MD, Town T, Lee GR, Flavell RA (June 2005). "Interchromosomal associations between alternatively expressed loci". Nature. 435 (7042): 637–645. Bibcode:2005Natur.435..637S. doi:10.1038/nature03574. PMID 15880101. ^ Williams, A; Spilianakis, CG; Flavell, RA (April 2010). "Interchromosomal association and gene regulation in trans". Trends in Genetics. 26 (4): 188–197. doi:10.1016/j.tig.2010.01.007. PMC 2865229. PMID 20236724. ^ Beadle GW, Tatum EL (1941). "Genetic Control of Biochemical Reactions in Neurospora". Proc. Natl. Acad. Sci. U.S.A. 27 (11): 499–506. Bibcode:1941PNAS...27..499B. doi:10.1073/pnas.27.11.499. PMC 1078370. PMID 16588492. ^ Horowitz NH, Berg P, Singer M, Lederberg J, Susman M, Doebley J, Crow JF (2004). "A centennial: George W. Beadle, 1903–1989". Genetics. 166 (1): 1–10. doi:10.1534/genetics.166.1.1. PMC 1470705. PMID 15020400. ^ Marande W, Burger G (October 2007). "Mitochondrial DNA as a genomic jigsaw puzzle". Science. AAAS. 318 (5849): 415. Bibcode:2007Sci...318..415M. doi:10.1126/science.1148033. PMID 17947575. ^ Parra G, Reymond A, Dabbouseh N, Dermitzakis ET, Castelo R, Thomson TM, Antonarakis SE, Guigó R (January 2006). "Tandem chimerism as a means to increase protein complexity in the human genome". Genome Research. 16 (1): 37–44. doi:10.1101/gr.4145906. PMC 1356127. PMID 16344564. ^ a b Eddy SR (December 2001). "Non-coding RNA genes and the modern RNA world". Nat. Rev. Genet. 2 (12): 919–929. doi:10.1038/35103511. PMID 11733745. ^ Crick FH, Barnett L, Brenner S, Watts-Tobin RJ (1961). "General nature of the genetic code for proteins". Nature. 192 (4809): 1227–1232. doi:10.1038/1921227a0. PMID 13882203. ^ Crick, Francis (1962). "The genetic code". Scientific American. WH Freeman and Company. 207 (4): 66–74. doi:10.1038/scientificamerican1062-66. PMID 13882204. ^ Woodson SA (May 1998). "Ironing out the kinks: splicing and translation in bacteria". Genes & Development. 12 (9): 1243–1247. doi:10.1101/gad.12.9.1243. PMID 9573040. ^ Jacob F; Monod J (June 1961). "Genetic regulatory mechanisms in the synthesis of proteins". J Mol Biol. 3 (3): 318–356. doi:10.1016/S0022-2836(61)80072-7. PMID 13718526. ^ Koonin, Eugene V.; Dolja, Valerian V.; Morris, T. Jack (January 1993). "Evolution and Taxonomy of Positive-Strand RNA Viruses: Implications of Comparative Analysis of Amino Acid Sequences". Critical Reviews in Biochemistry and Molecular Biology. 28 (5): 375–430. doi:10.3109/10409239309078440. PMID 8269709. ^ Domingo, Esteban (2001). "RNA Virus Genomes". eLS. doi:10.1002/9780470015902.a0001488.pub2. ISBN 978-0470016176. ^ Domingo, E; Escarmís, C; Sevilla, N; Moya, A; Elena, SF; Quer, J; Novella, IS; Holland, JJ (June 1996). "Basic concepts in RNA virus evolution". FASEB Journal. 10 (8): 859–864. doi:10.1096/fasebj.10.8.8666162. PMID 8666162. ^ Morris, KV; Mattick, JS (June 2014). "The rise of regulatory RNA". Nature Reviews Genetics. 15 (6): 423–437. doi:10.1038/nrg3722. PMC 4314111. PMID 24776770. ^ Miko, Ilona (2008). "Gregor Mendel and the Principles of Inheritance". Nature Education Knowledge. SciTable. Nature Publishing Group. 1 (1): 134. ^ Chial, Heidi (2008). "Mendelian Genetics: Patterns of Inheritance and Single-Gene Disorders". Nature Education Knowledge. SciTable. Nature Publishing Group. 1 (1): 63. ^ McCarthy D, Minner C, Bernstein H, Bernstein C (1976). "DNA elongation rates and growing point distributions of wild-type phage T4 and a DNA-delay amber mutant". J. Mol. Biol. 106 (4): 963–981. doi:10.1016/0022-2836(76)90346-6. PMID 789903. ^ a b Lobo, Ingrid; Shaw, Kelly (2008). "Discovery and Types of Genetic Linkage". Nature Education Knowledge. SciTable. Nature Publishing Group. 1 (1): 139. ^ Nachman MW, Crowell SL (September 2000). "Estimate of the mutation rate per nucleotide in humans". Genetics. 156 (1): 297–304. PMC 1461236. PMID 10978293. ^ Roach JC, Glusman G, Smit AF, et al. (April 2010). "Analysis of genetic inheritance in a family quartet by whole-genome sequencing". Science. 328 (5978): 636–639. Bibcode:2010Sci...328..636R. doi:10.1126/science.1186802. PMC 3037280. PMID 20220176. ^ a b Drake JW, Charlesworth B, Charlesworth D, Crow JF (April 1998). "Rates of spontaneous mutation". Genetics. 148 (4): 1667–1686. PMC 1460098. PMID 9560386. ^ "What kinds of gene mutations are possible?". Genetics Home Reference. United States National Library of Medicine. 11 May 2015. Retrieved 19 May 2015. ^ Andrews, Christine A. (2010). "Natural Selection, Genetic Drift, and Gene Flow Do Not Act in Isolation in Natural Populations". Nature Education Knowledge. SciTable. Nature Publishing Group. 3 (10): 5. ^ Patterson, C (November 1988). "Homology in classical and molecular biology". Molecular Biology and Evolution. 5 (6): 603–625. doi:10.1093/oxfordjournals.molbev.a040523. PMID 3065587. ^ Studer, RA; Robinson-Rechavi, M (May 2009). "How confident can we be that orthologs are similar, but paralogs differ?". Trends in Genetics. 25 (5): 210–6. doi:10.1016/j.tig.2009.03.004. PMID 19368988. ^ Altenhoff, AM; Studer, RA; Robinson-Rechavi, M; Dessimoz, C (2012). "Resolving the ortholog conjecture: orthologs tend to be weakly, but significantly, more similar in function than paralogs". PLOS Computational Biology. 8 (5): e1002514. Bibcode:2012PLSCB...8E2514A. doi:10.1371/journal.pcbi.1002514. PMC 3355068. PMID 22615551. ^ Nosil, Patrik; Funk, Daniel J.; Ortiz-Barrientos, Daniel (February 2009). "Divergent selection and heterogeneous genomic divergence". Molecular Ecology. 18 (3): 375–402. doi:10.1111/j.1365-294X.2008.03946.x. PMID 19143936. ^ Emery, Laura. "Introduction to Phylogenetics". EMBL-EBI. Retrieved 19 May 2015. ^ Mitchell, Matthew W.; Gonder, Mary Katherine (2013). "Primate Speciation: A Case Study of African Apes". Nature Education Knowledge. SciTable. Nature Publishing Group. 4 (2): 1. ^ a b Guerzoni, D; McLysaght, A (November 2011). "De novo origins of human genes". PLOS Genetics. 7 (11): e1002381. doi:10.1371/journal.pgen.1002381. PMC 3213182. PMID 22102832. ^ Reams, AB; Roth, JR (2 February 2015). "Mechanisms of gene duplication and amplification". Cold Spring Harbor Perspectives in Biology. 7 (2): a016592. doi:10.1101/cshperspect.a016592. PMC 4315931. PMID 25646380. ^ Demuth, JP; De Bie, T; Stajich, JE; Cristianini, N; Hahn, MW (20 December 2006). "The evolution of mammalian gene families". PLoS ONE. 1: e85. Bibcode:2006PLoSO...1...85D. doi:10.1371/journal.pone.0000085. PMC 1762380. PMID 17183716. ^ Knowles, DG; McLysaght, A (October 2009). "Recent de novo origin of human protein-coding genes". Genome Research. 19 (10): 1752–1759. doi:10.1101/gr.095026.109. PMC 2765279. PMID 19726446. ^ Wu, DD; Irwin, DM; Zhang, YP (November 2011). "De novo origin of human protein-coding genes". PLOS Genetics. 7 (11): e1002379. doi:10.1371/journal.pgen.1002379. PMC 3213175. PMID 22102831. ^ McLysaght, Aoife; Guerzoni, Daniele (31 August 2015). "New genes from non-coding sequence: the role of de novo protein-coding genes in eukaryotic evolutionary innovation". Philosophical Transactions of the Royal Society B: Biological Sciences. 370 (1678): 20140332. doi:10.1098/rstb.2014.0332. PMC 4571571. PMID 26323763. ^ Neme, Rafik; Tautz, Diethard (2013). "Phylogenetic patterns of emergence of new genes support a model of frequent de novo evolution". BMC Genomics. 14 (1): 117. doi:10.1186/1471-2164-14-117. PMC 3616865. PMID 23433480. ^ Treangen, TJ; Rocha, EP (27 January 2011). "Horizontal transfer, not duplication, drives the expansion of protein families in prokaryotes". PLOS Genetics. 7 (1): e1001284. doi:10.1371/journal.pgen.1001284. PMC 3029252. PMID 21298028. ^ Ochman, H; Lawrence, JG; Groisman, EA (18 May 2000). "Lateral gene transfer and the nature of bacterial innovation". Nature. 405 (6784): 299–304. Bibcode:2000Natur.405..299O. doi:10.1038/35012500. PMID 10830951. ^ Keeling, PJ; Palmer, JD (August 2008). "Horizontal gene transfer in eukaryotic evolution". Nature Reviews Genetics. 9 (8): 605–618. doi:10.1038/nrg2386. PMID 18591983. ^ Schönknecht, G; Chen, WH; Ternes, CM; Barbier, GG; Shrestha, RP; Stanke, M; Bräutigam, A; Baker, BJ; Banfield, JF; Garavito, RM; Carr, K; Wilkerson, C; Rensing, SA; Gagneul, D; Dickenson, NE; Oesterhelt, C; Lercher, MJ; Weber, AP (8 March 2013). "Gene transfer from bacteria and archaea facilitated evolution of an extremophilic eukaryote". Science. 339 (6124): 1207–1210. Bibcode:2013Sci...339.1207S. doi:10.1126/science.1231707. PMID 23471408. ^ Watson, JD, Baker TA, Bell SP, Gann A, Levine M, Losick R. (2004). "Ch9-10", Molecular Biology of the Gene, 5th ed., Peason Benjamin Cummings; CSHL Press. ^ "Integr8 – A.thaliana Genome Statistics". ^ "Understanding the Basics". The Human Genome Project. Retrieved 26 April 2015. ^ "WS227 Release Letter". WormBase. 10 August 2011. Retrieved 19 November 2013. ^ Yu, J. (5 April 2002). "A Draft Sequence of the Rice Genome (Oryza sativa L. ssp. indica)". Science. 296 (5565): 79–92. Bibcode:2002Sci...296...79Y. doi:10.1126/science.1068037. PMID 11935017. ^ a b Anderson, S.; Bankier, A.T.; Barrell, B.G. ; de Bruijn, M.H. L.; Coulson, A.R. ; Drouin, J.; Eperon, I.C. ; Nierlich, D.P. ; Roe, B. A.; Sanger, F.; Schreier, P.H. ; Smith, A.J.H. ; Staden, R.; Young, I.G. (9 April 1981). "Sequence and organization of the human mitochondrial genome". Nature. 290 (5806): 457–465. Bibcode:1981Natur.290..457A. doi:10.1038/290457a0. PMID 7219534. ^ Adams, M.D. (24 March 2000). "The Genome Sequence of Drosophila melanogaster". Science. 287 (5461): 2185–2195. Bibcode:2000Sci...287.2185.. CiteSeerX 10.1.1.549.8639. doi:10.1126/science.287.5461.2185. PMID 10731132. ^ a b Pertea, Mihaela; Salzberg, Steven L (2010). "Between a chicken and a grape: estimating the number of human genes". Genome Biology. 11 (5): 206. doi:10.1186/gb-2010-11-5-206. PMC 2898077. PMID 20441615. ^ Belyi, V.A. ; Levine, A.J. ; Skalka, A.M. (22 September 2010). "Sequences from Ancestral Single-Stranded DNA Viruses in Vertebrate Genomes: the Parvoviridae and Circoviridae Are More than 40 to 50 Million Years Old". Journal of Virology. 84 (23): 12458–12462. doi:10.1128/JVI.01789-10. PMC 2976387. PMID 20861255. ^ Flores, Ricardo; Di Serio, Francesco; Hernández, Carmen (February 1997). "Viroids: The Noncoding Genomes". Seminars in Virology. 8 (1): 65–73. doi:10.1006/smvy.1997.0107. ^ Zonneveld, B.J.M. (2010). "New Record Holders for Maximum Genome Size in Eudicots and Monocots". Journal of Botany. 2010: 1–4. doi:10.1155/2010/527357. ^ Yu J, Hu S, Wang J, Wong GK, Li S, Liu B, Deng Y, Dai L, Zhou Y, Zhang X, Cao M, Liu J, Sun J, Tang J, Chen Y, Huang X, Lin W, Ye C, Tong W, Cong L, Geng J, Han Y, Li L, Li W, Hu G, Huang X, Li W, Li J, Liu Z, Li L, Liu J, Qi Q, Liu J, Li L, Li T, Wang X, Lu H, Wu T, Zhu M, Ni P, Han H, Dong W, Ren X, Feng X, Cui P, Li X, Wang H, Xu X, Zhai W, Xu Z, Zhang J, He S, Zhang J, Xu J, Zhang K, Zheng X, Dong J, Zeng W, Tao L, Ye J, Tan J, Ren X, Chen X, He J, Liu D, Tian W, Tian C, Xia H, Bao Q, Li G, Gao H, Cao T, Wang J, Zhao W, Li P, Chen W, Wang X, Zhang Y, Hu J, Wang J, Liu S, Yang J, Zhang G, Xiong Y, Li Z, Mao L, Zhou C, Zhu Z, Chen R, Hao B, Zheng W, Chen S, Guo W, Li G, Liu S, Tao M, Wang J, Zhu L, Yuan L, Yang H (April 2002). "A draft sequence of the rice genome (Oryza sativa L. ssp. indica)". Science. 296 (5565): 79–92. Bibcode:2002Sci...296...79Y. doi:10.1126/science.1068037. PMID 11935017. ^ Perez-Iratxeta C, Palidwor G, Andrade-Navarro MA (December 2007). "Towards completion of the Earth's proteome". EMBO Reports. 8 (12): 1135–1141. doi:10.1038/sj.embor.7401117. PMC 2267224. PMID 18059312. ^ Kauffman SA (1969). "Metabolic stability and epigenesis in randomly constructed genetic nets". Journal of Theoretical Biology. Elsevier. 22 (3): 437–467. doi:10.1016/0022-5193(69)90015-0. PMID 5803332. ^ Schuler GD, Boguski MS, Stewart EA, Stein LD, Gyapay G, Rice K, White RE, Rodriguez-Tomé P, Aggarwal A, Bajorek E, Bentolila S, Birren BB, Butler A, Castle AB, Chiannilkulchai N, Chu A, Clee C, Cowles S, Day PJ, Dibling T, Drouot N, Dunham I, Duprat S, East C, Edwards C, Fan JB, Fang N, Fizames C, Garrett C, Green L, Hadley D, Harris M, Harrison P, Brady S, Hicks A, Holloway E, Hui L, Hussain S, Louis-Dit-Sully C, Ma J, MacGilvery A, Mader C, Maratukulam A, Matise TC, McKusick KB, Morissette J, Mungall A, Muselet D, Nusbaum HC, Page DC, Peck A, Perkins S, Piercy M, Qin F, Quackenbush J, Ranby S, Reif T, Rozen S, Sanders C, She X, Silva J, Slonim DK, Soderlund C, Sun WL, Tabar P, Thangarajah T, Vega-Czarny N, Vollrath D, Voyticky S, Wilmer T, Wu X, Adams MD, Auffray C, Walter NA, Brandon R, Dehejia A, Goodfellow PN, Houlgatte R, Hudson JR, Ide SE, Iorio KR, Lee WY, Seki N, Nagase T, Ishikawa K, Nomura N, Phillips C, Polymeropoulos MH, Sandusky M, Schmitt K, Berry R, Swanson K, Torres R, Venter JC, Sikela JM, Beckmann JS, Weissenbach J, Myers RM, Cox DR, James MR, Bentley D, Deloukas P, Lander ES, Hudson TJ (October 1996). "A gene map of the human genome". Science. 274 (5287): 540–546. Bibcode:1996Sci...274..540S. doi:10.1126/science.274.5287.540. PMID 8849440. ^ Chi, Kelly Rae (17 August 2016). "The dark side of the human genome". Nature. 538 (7624): 275–277. Bibcode:2016Natur.538..275C. doi:10.1038/538275a. PMID 27734873. ^ a b Claverie JM (September 2005). "Fewer genes, more noncoding RNA". Science. 309 (5740): 1529–1530. Bibcode:2005Sci...309.1529C. doi:10.1126/science.1116800. PMID 16141064. ^ Carninci P, Hayashizaki Y (April 2007). "Noncoding RNA transcription beyond annotated genes". Current Opinion in Genetics & Development. 17 (2): 139–144. doi:10.1016/j.gde.2007.02.008. PMID 17317145. ^ a b Hutchison, Clyde A.; Chuang, Ray-Yuan; Noskov, Vladimir N.; Assad-Garcia, Nacyra; Deerinck, Thomas J.; Ellisman, Mark H.; Gill, John; Kannan, Krishna; Karas, Bogumil J. (25 March 2016). "Design and synthesis of a minimal bacterial genome". Science. 351 (6280): aad6253. Bibcode:2016Sci...351.....H. doi:10.1126/science.aad6253. ISSN 0036-8075. PMID 27013737. ^ Glass, J. I.; Assad-Garcia, N.; Alperovich, N.; Yooseph, S.; Lewis, M.R. ; Maruf, M.; Hutchison, C.A. ; Smith, H.O. ; Venter, J.C. (3 January 2006). "Essential genes of a minimal bacterium". Proceedings of the National Academy of Sciences. 103 (2): 425–430. Bibcode:2006PNAS..103..425G. doi:10.1073/pnas.0510013103. PMC 1324956. PMID 16407165. ^ Gerdes, SY; Scholle, MD; Campbell, JW; Balázsi, G; Ravasz, E; Daugherty, MD; Somera, AL; Kyrpides, NC; Anderson, I; Gelfand, MS; Bhattacharya, A; Kapatral, V; D'Souza, M; Baev, MV; Grechkin, Y; Mseeh, F; Fonstein, MY; Overbeek, R; Barabási, AL; Oltvai, ZN; Osterman, AL (October 2003). "Experimental determination and system level analysis of essential genes in Escherichia coli MG1655". Journal of Bacteriology. 185 (19): 5673–5684. doi:10.1128/jb.185.19.5673-5684.2003. PMC 193955. PMID 13129938. ^ Baba, T; Ara, T; Hasegawa, M; Takai, Y; Okumura, Y; Baba, M; Datsenko, KA; Tomita, M; Wanner, BL; Mori, H (2006). "Construction of Escherichia coli K-12 in-frame, single-gene knockout mutants: the Keio collection". Molecular Systems Biology. 2: 2006.0008. doi:10.1038/msb4100050. PMC 1681482. PMID 16738554. ^ a b Juhas, M; Reuß, DR; Zhu, B; Commichau, FM (November 2014). "Bacillus subtilis and Escherichia coli essential genes and minimal cell factories after one decade of genome engineering". Microbiology. 160 (Pt 11): 2341–2351. doi:10.1099/mic.0.079376-0. PMID 25092907. ^ Tu, Z; Wang, L; Xu, M; Zhou, X; Chen, T; Sun, F (21 February 2006). "Further understanding human disease genes by comparing with housekeeping genes and other genes". BMC Genomics. 7: 31. doi:10.1186/1471-2164-7-31. PMC 1397819. PMID 16504025. ^ Georgi, B; Voight, BF; Bućan, M (May 2013). "From mouse to human: evolutionary genomics analysis of human orthologs of essential genes". PLOS Genetics. 9 (5): e1003484. doi:10.1371/journal.pgen.1003484. PMC 3649967. PMID 23675308. ^ Eisenberg, E; Levanon, EY (October 2013). "Human housekeeping genes, revisited". Trends in Genetics. 29 (10): 569–574. doi:10.1016/j.tig.2013.05.010. PMID 23810203. ^ Amsterdam, A; Hopkins, N (September 2006). "Mutagenesis strategies in zebrafish for identifying genes involved in development and disease". Trends in Genetics. 22 (9): 473–478. doi:10.1016/j.tig.2006.06.011. PMID 16844256. ^ "About the HGNC". HGNC Database of Human Gene Names. HUGO Gene Nomenclature Committee. Retrieved 14 May 2015. ^ Stanley N. Cohen; Annie C.Y. Chang (1 May 1973). "Recircularization and Autonomous Replication of a Sheared R-Factor DNA Segment in Escherichia coli Transformants". PNAS. 70 (5): 1293–1297. Bibcode:1973PNAS...70.1293C. doi:10.1073/pnas.70.5.1293. PMC 433482. PMID 4576014. Retrieved 17 July 2010. ^ Esvelt, KM. ; Wang, HH. (2013). "Genome-scale engineering for systems and synthetic biology". Mol Syst Biol. 9 (1): 641. doi:10.1038/msb.2012.66. PMC 3564264. PMID 23340847. ^ Tan, WS. ; Carlson, DF. ; Walton, MW. ; Fahrenkrug, SC. ; Hackett, PB. (2012). "Precision editing of large animal genomes". Adv Genet. Advances in Genetics. 80: 37–97. doi:10.1016/B978-0-12-404742-6.00002-8. ISBN 9780124047426. PMC 3683964. PMID 23084873. ^ Puchta, H.; Fauser, F. (2013). "Gene targeting in plants: 25 years later". Int. J. Dev. Biol. 57 (6–7–8): 629–637. doi:10.1387/ijdb.130194hp. PMID 24166445. ^ Ran FA, Hsu PD, Wright J, Agarwala V, Scott DA, Zhang F (2013). "Genome engineering using the CRISPR-Cas9 system". Nat Protoc. 8 (11): 2281–308. doi:10.1038/nprot.2013.143. PMC 3969860. PMID 24157548. ^ Kittleson, Joshua (2012). "Successes and failures in modular genetic engineering". Current Opinion in Chemical Biology. 16 (3–4): 329–336. doi:10.1016/j.cbpa.2012.06.009. PMID 22818777. ^ Berg, P.; Mertz, J.E. (2010). "Personal Reflections on the Origins and Emergence of Recombinant DNA Technology". Genetics. 184 (1): 9–17. doi:10.1534/genetics.109.112144. PMC 2815933. PMID 20061565. ^ Austin, Christopher P.; Battey, James F.; Bradley, Allan; Bucan, Maja; Capecchi, Mario; Collins, Francis S.; Dove, William F.; Duyk, Geoffrey; Dymecki, Susan (September 2004). "The Knockout Mouse Project". Nature Genetics. 36 (9): 921–924. doi:10.1038/ng0904-921. ISSN 1061-4036. PMC 2716027. PMID 15340423. ^ Guan, Chunmei; Ye, Chao; Yang, Xiaomei; Gao, Jiangang (2010). "A review of current large-scale mouse knockout efforts". Genesis. 48 (2): 73–85. doi:10.1002/dvg.20594. PMID 20095055. ^ Deng C (2007). "In celebration of Dr. Mario R. Capecchi's Nobel Prize". International Journal of Biological Sciences. 3 (7): 417–419. doi:10.7150/ijbs.3.417. PMC 2043165. PMID 17998949. Alberts B, Johnson A, Lewis J, Raff M, Roberts K, Walter P (2002). Molecular Biology of the Cell (Fourth ed.). New York: Garland Science. ISBN 978-0-8153-3218-3. – A molecular biology textbook available free online through NCBI Bookshelf. Watson JD, Baker TA, Bell SP, Gann A, Levine M, Losick R (2013). Molecular Biology of the Gene (7th ed.). Benjamin Cummings. ISBN 978-0-321-90537-6. Dawkins R (1990). The Selfish Gene. Oxford University Press. ISBN 978-0-19-286092-7. Google Book Search; first published 1976. Ridley M (1999). Genome: The Autobiography of a Species in 23 Chapters. Fourth Estate. ISBN 978-0-00-763573-3. Brown, T (2002). Genomes (2nd ed.). New York: Wiley-Liss. ISBN 978-0-471-25046-3.